(Release Date: November 18, 2014)  In adapting Stephen King's 1989 novel, "The Dark Half," writer-director George A. Romero is exceedingly faithful to his source material. Though the outcome is bloated and overlong, clocking in at 123 minutes when 100 would have no doubt bred a fleeter, tauter version, there are few lingering signs that this production was troubled. In spite of budget issues, rocky on-set relationships (lead Timothy Hutton allegedly took method acting to extremes), and a two-year release delay after studio Orion filed for bankruptcy, this is a riveting horror-thriller with a textured sense of location and encroaching menace. Hutton stars as Thad Beaumont, an author who has found more success writing pulpy crime novels under pseudonym George Stark than he has penning more literary works under his real name. When a mysterious man named Fred Klawson (Robert Joy) threatens to reveal Stark's identity if he doesn't pay up, Thad decides to bury his pen name for good. When a series of brutal murders arise soon after and Thad's fingerprints are found at the crime scenes, he is left perplexed and fearing for his family's life. Has the fictionalized George Stark materialized from Thad's imagination, angry over being "killed off," or is Thadinundated once more by the debilitating headaches and sounds of sparrows that plagued him as a childlosing his mind? "The Dark Half" kicks off with a jolting, queasy start when surgery on young Thad's brain reveals an unborn twin who was absorbed into his body at conception. From there, the film compels and unsettles as the stakes mount, with director George A. Romero displaying a crafty ingenuity at visualizing the story's wilder fantasy elements. As the adult Thad and his homicidal alter-ego George, Timothy Hutton is superb in an intricately written dual role, while Amy Madigan does fine work as wife Liz. As the movie's second hour plays out, the mystery of what's going on lessens, leading to pretty much exactly what is expected. The third act (completed during post-production reshoots) is especially drawn out and sloppy, in need of a judicious editor and some serious fat-trimming. "The Dark Half" does not ultimately live up to all that it promises, but the film is technically inventive and excels by focusing on characters without skimping on grisly payoffs. 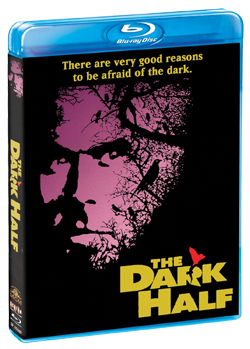 Scream Factory 1080p transfer of "The Dark Half" is exceptional, its film source in strikingly clean, healthy shape. Age-related damage is very minor, with only rare instances of a speck or two popping up. For the most part, though, this twenty-plus-year-old picture looks like it could have been made last year. Colors are bold, blacks are deep, detail and clarity are on point, and depth is frequently stunning, particularly during the daytime scenes. A soft shot here and there pop up, but my inclination is that this is inherent to the source and not an issue of any consequence with the transfer. The 5.1 DTS-HD Master Audio is quite good, as well, perhaps not as showy as the lush picture but still pleasingly active across the soundfield. Additionally, Christopher Young's elegant music score has never sounded better. When one thinks of cinematic Stephen King adaptations, "The Dark Half" is probably not the first (or the tenth) that comes to mind. The film was plagued with issues prior to release and made only $10-million at the box office in 1993. The joy of Scream Factory's filled-to-bursting Blu-ray release is that audiences who may have forgotten about the movie or never seen it will get a chance to (re)discover its macabre pleasures. The film hasn't looked or sounded this good since it was in theaters, and the breadth of bonus content only sweetens the deal. "The Dark Half" has its problem spots and a finale that is no match for what has come before, but the film remains one worth checking out. This Blu-ray edition, made with tender, loving care by the folks at Scream Factory, is the perfect way to do that.